Consuming Surrealism in American Culture: Dissident Modernism argues that Surrealism worked as a powerful agitator to disrupt dominant ideas of modern art in the United States. 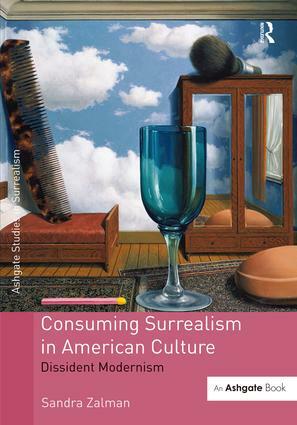 Unlike standard accounts that focus on Surrealism in the U.S. during the 1940s as a point of departure for the ascendance of the New York School, this study contends that Surrealism has been integral to the development of American visual culture over the course of the twentieth century. Through analysis of Surrealism in both the museum and the marketplace, Sandra Zalman tackles Surrealism’s multi-faceted circulation as both elite and popular. Zalman shows how the American encounter with Surrealism was shaped by Alfred Barr, William Rubin and Rosalind Krauss as these influential curators mobilized Surrealism to compose, to concretize, or to unseat narratives of modern art in the 1930s, 1960s and 1980s - alongside Surrealism’s intersection with advertising, Magic Realism, Pop, and the rise of contemporary photography. As a popular avant-garde, Surrealism openly resisted art historical classification, forcing the supposedly distinct spheres of modernism and mass culture into conversation and challenging theories of modern art in which it did not fit, in large part because of its continued relevance to contemporary American culture. Sandra Zalman is Assistant Professor of Art History at the University of Houston. She has received grants from the American Council of Learned Societies, the American Association of University Women, and the Andy Warhol Foundation for the Visual Arts. With scholarly interest in Surrealism greater than ever, the Studies in Surrealism series serves as a forum for key areas of Surrealist inquiry today. This series extends the ongoing academic and popular interest in Surrealism, evident in recent studies that have rethought established areas of Surrealist activity and engagement, including those of politics, the object, photography, crime, and modern physics. Expanding and adding various lines of inquiry, books in the series examine Surrealism's intersections with philosophical, social, artistic, and literary themes. Potential subjects to be examined in the context of Surrealism include but are not limited to: nature; queer studies; humor and play; science; theory in the 1950s and 1960s; the New Novel; Surrealist activities beyond Paris. Proposals are welcomed for both monographs and essay collections dealing with the above subjects or with discussions of Surrealism in other aspects and genres. Monographic writings on artists and writers who have been generally overlooked by English-language scholarship (for instance, Victor Brauner, Toyen, Jorge Camacho) would also fall within the scope of this series.